Cell phone, camera, MP3 player and tablet charging cords get mixed up, misplaced, confused or taken by other family members. Surge protectors become overloaded with 4, 5 or 6 computer, printer, external hard drive, laptop cords that all look alike, and are often plugged in underneath a low-lit desk. Take the guesswork out of knowing what cord is in which plug and belongs to what device. 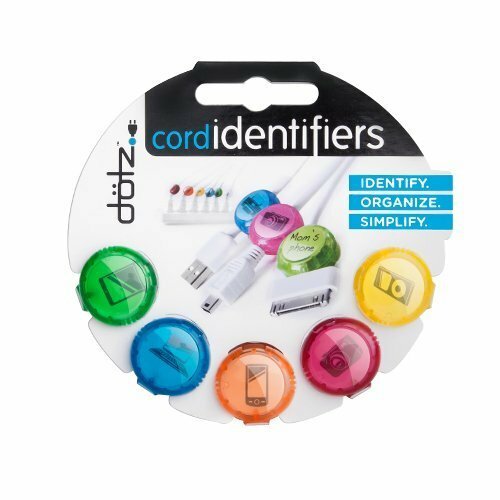 Cord Identifiers organize and identify each cord, cable or wire by color and a home and office icon that's preprinted on each Insert. Simply punch out one of the 10 Inserts built into the packaging and put it inside the Identifier; or write on the back of the insert to create your own identification. Snap the Identifier around the cord end to easily organize all standard diameter cords, cables and wires. It's that easy!